The renewed squad of the Ryukyu Golden Kings played its first game of the TKbj-League 2015-2016 season Oct. 2nd. The Ryukyu Golden Kings are off to a strong start in the last season of the TKbj-League with 5-1 after the first six games. The team faced the first two opponents on the road, and came off with three wins and one loss. The team’s first game on its home court was last weekend when they swept Nara Bambitious in both matches, and have now five wins against one loss. That’s a great start for the season. Kings’ fans still have the bitter memory of the last season’s playoffs when the Kings lost the first round game against Hamamatsu Higashimikawa Phoenix even though the game was played on the Kings’ home court. The team thus missed a big chance to win its second championship in a row, and the loss was all the more disappointing as the miss was not in the final but in the first round of the playoffs. This season is actually the last for the TKbj-League, as the league will merge with the competing National Basketball League (NBL) into the new B.League that will commence in October 2016. The merger was the result of the basketball’s governing international body, FIBA, suspending Japanese pro-basketball from international competition in order to force the two competing leagues to join forces. The Ryukyu Golden Kings will play as one of the teams in its top division starting next season. 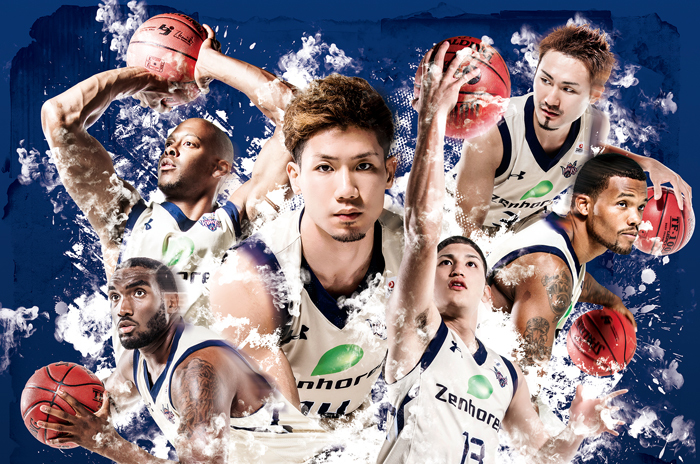 With the Japanese basketball finally under one roof, fans can expect much stiffer competition, and thus more exciting games, in the one league. While the Golden Kings have a slot in the first league, some other teams from bj-League are demoted to the second league from the next season. For this season the Kings released two big men from the team, Kibwe Trim and Anthony Kent, and signed up Evan Ravenel who at 204 cm is the tallest player in the team. So, on average the team is shorter but the idea is to have more speed, especially with its new point guard Shuhei Kitagawa and also 19-year-old Shouta Tsuyama, the youngest player of the team. Both joined after Narito Namizato left. Evan Ravenel is an all-round type player. As required by the rules of the new B.League, the Golden Kings signed a hometown agreement with Okinawa City. As a part of the deal the city has agreed to construct a huge new home arena for the team. It will be located in the Koza Sports Park in the Moromizato district of the city just off the Okinawa Expressway Kadena exit. The Kings traditionally command by far the largest – an noisiest – crowd of fans in the league in their home games. So let’s all continue the tradition and cheer our local super squad at our home court. Hi-five with whoever sits next to you in the Kings’ next game, and let’s have a good time together!! Go! Go! Kings! Let the good times roll!